Entering the world of stock trading is definitely a very exciting time for many people. Most new traders are allured by the potential to make large sums of money in the stock market. This kind of excitement can be a great motivator for new traders, however, it can also cause them to make some hasty, irrational decisions. When people get distracted by the potential for huge gains, they start treating day trading like a lottery. Trading is not a lottery and stocks are not lottery tickets. You should never bet on a “hot stock pick” or go “all in” on a play. Trading is an art that requires training and discipline. Success is possible, but it is a process not an instant gratification. If you want to become a successful day trader, you need to put in the hours and work for it. 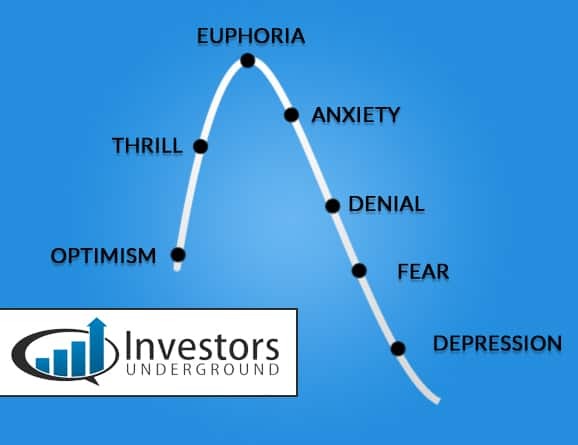 I have been running Investors Underground for a long time now and trading for even longer. 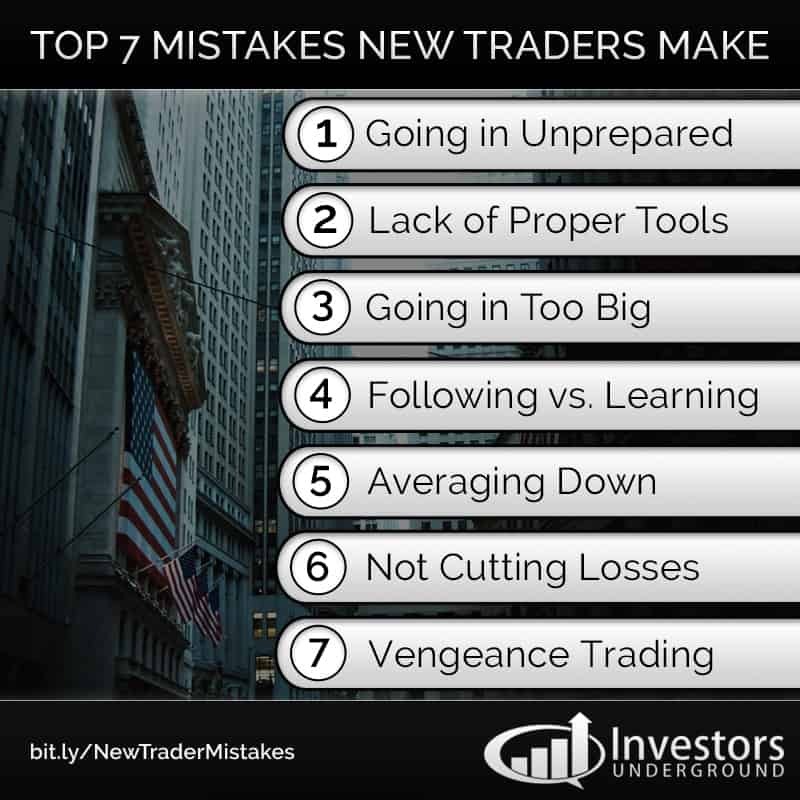 I often see new traders repeat the same mistakes. I want to help you avoid making these mistakes so that you can have the best shot at success. As mentioned above, trading stocks should not reflect gambling. You are not going to get rich by luck. Sure, a little bit of luck can be helpful, but you should never depend on it. You need to be prepared for the markets. The first step in preparation is education. You need to educate yourself about trading so that you are properly equipped to master the stock market. You need to know how the market works, what kinds of setups you are looking for and why, and how you will react in a trade. When we have new traders approach us about getting started with trading, we always recommend our DVD’s first. This isn’t solely because we make money off of them because we could just as easily sell a monthly subscription. We recommend that new traders watch the DVDs so that they can come to the market prepared and confident. Going into the market unprepared is very risky and many traders blow up their accounts due to their hastiness. Don’t get taken out of the game that fast. Prepare yourself so you can have the highest chances of success. Trading is an art, and just like any craft, it requires the proper tools and resources. Try building a house without a hammer and nails; it’s not gonna happen. If you want to set yourself up for success in the stock market, you need to make sure you have access to the proper tools. These tools may include brokers, trading software, educational resources, and more. Make sure your toolbox is adequately supplied before you embark on your trading journey. You’d be surprised at how valuable a single tool such as a broker or platform can be. Do your research and make sure you have what you need to properly execute your trading plan. You will often see many parallels between new traders and gamblers because the stock market and the casino both have a similar appeal. They offer you the opportunity to turn a small sum of money into a much larger one. Most people know that they have very low odds in the casino, however, not many people realize that they have similar odds in the stock market if they take the wrong approach. We’ve already mentioned the significance of preparation – this is the first step to success in the markets. The next step is proper money management. Money management is just as important as trading strategy because it helps your protect your capital. It also gives you more cushion for losing trades. If you only use 10% of your capital for any trade, you can never blow up your account from a single trade. 10% is an arbitrary number, but you should get the point. If you go in too big on plays, you expose yourself to unnecessary risk. Even a trader with a 90% win rate stands a chance of blowing up their account if they go all in. You wouldn’t go into a casino and put your life savings on red at the roullette table (hopefully), so why would you take unnecessary risks in your trades? Make sure you are never gambling and focus on managing your money properly. Sure, it’s easy to think about the potential gains, but you can’t forget about the potential losses. It may sting a bit to feel like you could have made more on a trade but it will sting significantly harder if you blow up your trading account and take yourself out of the game. When people get started in trading, they often look for a mentor to learn from. There’s nothing wrong with that. In fact, it’s great to learn from the successes and failures of an experienced trader. The problem comes in when you try to replicate their success through mimicry. That’s the problem with a lot of alerts services. They attract traders who simply want to copy the exact trades of a successful trader. You should be focused on becoming self sufficient. When was the last time you heard someone attribute their success to copying a “guru’s” trades? It just doesn’t work like that. Learn from others, but don’t follow them. One of the worst mistakes new traders make is averaging down. This is a great way to turn a small loss into an account-ruiner. We’ve all been there before. You’ve already committed to a trade so now you feel like you have to follow through. “The stock was cheap when I bought it at $5, so $4 is a steal!” This logic is flawed and it will get you into trouble. When you average down, you’re adding to a losing position, thus digging yourself deeper in a hole. You’re better off cutting losses early. No one likes to take losses, but taking a small loss is much better than getting yourself in a position where you can be taken out of the trading game. There will be plenty of other trading opportunities if you preserve your capital. Have a trading plan and stick to it. Not cutting losses is similar to averaging down. It will hold you back and potentially ruin your account. As mentioned before, no one likes taking losses, but it is an important part of the game. Just consider it the cost of doing business. If you hold onto a loser, you expose yourself to unnecessary risk. That $100 loss can easily go to $200, $400, $1000 and beyond. You need to know how much money you are willing to risk on a play and then follow through with it. It’s important to have a maximum dollar amount that you are willing to risk. If you ever lose more than that, you broke your trading rules. Be smart about cutting losses early and you will have a much stronger chance of succeeding in the markets. There’s nothing worse than trying to make up for a bad trade by placing more trades. “I just lost $500 so now I need to find a $500 trade to make it back.” When you do this, you are trading emotionally and that is a recipe for disaster. You should never trade to make up for losses. You should only trade when you have a prime setup and a solid trading plan. If you start feeling like you are trading emotionally, step back and take a breath. You don’t have to keep trading. This can help prevent you from making a poor trade that you will regret in the long run. Remember, there will always be more opportunities to make money if you preserve your capital. Don’t get too anxious.